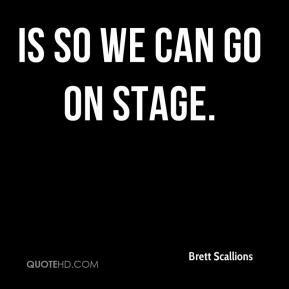 is so we can go on stage. 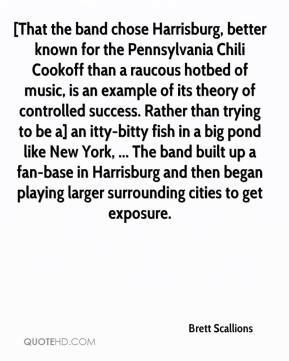 [That the band chose Harrisburg, better known for the Pennsylvania Chili Cookoff than a raucous hotbed of music, is an example of its theory of controlled success. Rather than trying to be a] an itty-bitty fish in a big pond like New York, ... The band built up a fan-base in Harrisburg and then began playing larger surrounding cities to get exposure. The exposure will be great and plus -- it's Aerosmith! ... They're legends. It's going to be really cool. 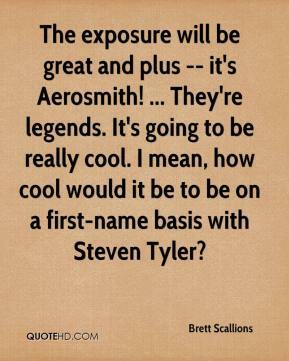 I mean, how cool would it be to be on a first-name basis with Steven Tyler?